The Sagrada Familia. Angkor Wat. The Acropolis. Westminster Abbey. The Sistine Chapel. Wherever in the world you find yourself, you are likely to be drawn into some of the most elaborate and breathtaking structures you will ever see, most of them created with divinity in mind. More than 20% of UNESCO’s world heritage cultural sites were directly influenced by religion – temples, cathedrals, and even entire cities devoted to the God or gods whom protected and guided their civilizations from one generation to the next. These sites represent a large chunk of travel guides and appeal to both the religious and non-religious alike due to their architectural grandeur, violent history, or societal significance, and a few of them might be even be on your bucket list. That being said, visitors to South Korea might be surprised – and a little bit crushed – to discover that the country’s rapidly-growing Christian population may be a hindrance to the dozens of historical sites and customs constructed by Buddhist, Confucian, and Shamanist devotees. Nearly 30% of South Koreans are self-professed Christians of some sort, a staggering number considering that barely 50% of the population adheres to any religion at all. Although South Korea still has its fair share of touristy temples, shrines, and folk customs, some of the more prominent attractions in Seoul might actually be the ubiquitous (and eerily vampiric) glowing red crosses floating across the city’s skyline. It’s all pretty impressive considering that it only took Christianity about three centuries to completely trump Buddhism, which had been rooted in Korean society since 688. Protestant missionaries arrived in the country in the late 19th century, training future Korean leaders in the midst of a major war, watching as the fruits of their labor blossomed into flocks of followers thirsty for salvation in a war-torn and divided nation. 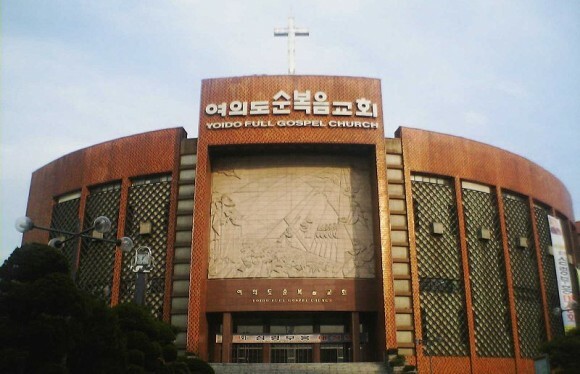 South Korea now boasts the largest Christian congregation in the world: the 1,000,000-strong behemoth, Yoido Full Gospel Church, founded by Buddhist-turned born-again “Emeritus” Pastor David Yonggi Cho in 1973. The church, by the way, also has 5,000 “satellite” churches, offers services in six languages besides Korean, and dwarfs American Pastor Joel Osteen’s Lakewood Church, with its paltry 43,000 attendees. As religion typically does, Christianity seized its opportunity as soon as a political vacuum opened: after the Joseon dynasty fell and Japan annexed Korea in 1910, colonized Koreans watched in horror as their national identity crumbled, forcibly replaced by Japanese language and customs. Historians posit that Christianity became the literal “salvation” of the Korean nation. Influenced by U.S. troops during the Korean War, many Korean soldiers converted during their service as Christianity came out of the war victorious. Methodist President Syngman Rhee led the first Korean republic as a Christian nation. Buddhism, in comparison, was not accepted anywhere near as seamlessly when it came to the Shilla kingdom in the 4th century: “only a miraculous spillage of white blood from a beheaded Buddhist supporter could convince the nobles to recognize Buddhism’s power.” In 1950, only 2.4% of Koreans were Protestant; now, they comprise most of that 30% figure. For the most part, the sudden jolt of Bible-thumping has not disrupted the overall progress of the country. In fact, many believe that the increase in ethics and morale (many of South Korea’s policymakers, as well as current president Lee Myung-bak, are avid church-goers) has benefited politics, which had in the past been rife with corruption. Korean Christians also trumpet the religion’s egalitarian philosophies, which they claim have worked to promote women’s’ rights and ease the strict hierarchy system carried over from Confucianism. But others fear that some fundamental Christians seek to disintegrate much of what visitors know to be distinctly “Korean” values and treasures. Some radical churches have forbidden “samulnori” – groups who play traditional farmer’s music – from public performances, claiming that the music, which has shamanistic origins, rouses the devil. Other Christians have shattered familial ties (so crucial to Koreans) with Buddhist parents and siblings, convinced that they are all going to hell. A few zealous church members hustle passersby on the street, concerned about their lack of salvation, and distribute fliers forcefully, sometimes following a single person for several blocks before they finally take a hint and are swatted away. In some churches, visiting a fortune-teller is criminalized, as is marrying outside of the church congregation. What makes the new generation of devotees different from their parents is that they are the first generation to proactively choose their own religion rather than accept it through lineage; as a result, many have been disowned from their Buddhist or atheist families or have flat-out left home of their own accord in obstinate pursuit of a Christian livelihood. Having attended a very large and expansive (547 churches in 42 different countries) Korean Baptist church for several years, I can offer a perspective that is relevant only to that particular church. However, I can see from where the aforementioned distress stems. Koreans have often been criticized as “instrumentalists” when it comes to religion; in other words, they tend to employ religion only insofar as it helps them achieve certain goals. For example, Korean “megachurches” are excellent vehicles for lonely people, especially people dislodged from their families, to make an infinite number of connections with others. The sense of community and even networking is pervasive. One church member told me that there was a “brother or sister for everything you ever needed” – a brother who worked in IT to help me install my cable service, a sister fluent in English, a brother who was an optometrist and could perform LASIK for me at a staunch discount. As a foreigner during my first year abroad, being part of a church was a convenient way for me to meet others and develop a social network, especially at a church with a considerable foreign ministry. Needless to say, it’s no surprise that such close-knit communities can result in a “boxed-in” ignorance of the outside world. Once you’re in the church bubble, it’s extremely difficult to break out. “Deserters” are often flaunted at fellowships as examples of “bad” Christians or poor examples of “loving brothers and sisters.” Not that this isn’t evident in Western churches, either, but keep in mind that South Korea is a place where fads catch on assertively and quickly (consider the effect of Korean pop music as a reference point), and even though Korean Christians may not like to admit it, Confucianism still plays a visible role even in the church: those who may not read the Bible the same way, disagree with the pastor’s view, or do not contribute the required 10% of their income to the church (known as “sipiljo”) may feel outcasted. Again, some of this might sound familiar to you as a church-goer in any Christian sect, but one important thing to consider, especially among bigger Korean churches, is the 10% “mandatory” tithe. 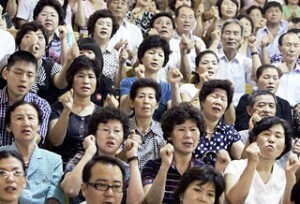 Let’s say that all of the attendees at Yoido Full Gospel church make a minimum salary of USD$24,000 per year. With over a million members, that yields $200,000,000 per month in “tithe” for just the main branch of the church alone. While a portion of those funds goes to costly Seoul property and assets such as a 10-story evangelical center and a television studio, that’s still an exorbitant amount of money, not to mention that at many churches this is not a donation, but compulsory (though there are exceptions…I often, and honestly, played the poor card to escape my $10 monthly fellowship dues). While some members feel that this money is well-spent and serves to further the church’s mission, outsiders consider megachurches a cluster of pyramid schemes or businesses preying on the good intentions of their members. It’s probably no accident that the majority of Korea’s political and business leaders – in other words, the ones able to provide the largest sums of “sipiljo” – identify themselves as Christian. In many ways Korean churches took what they liked from Western missionaries and added their own mix of (Confucian) traditions to create a more “Koreanized” blend of Christianity. For example, in my church women were not permitted to become pastors or fellowship leaders, despite much touting of the “egalitarianism” that Christianity had apparently cultivated (although the Yoido church does appoint female deacons). In typical adherence to a hierarchical system, church services involved nothing more than a (painfully long, two-hour) sermon by the head pastor and fellowships were usually lead by a sub-pastor; there was not much room – or desire – for Biblical discussion or the opinions and views of other church members. It took a great deal of effort on the part of foreign members in our English ministry to try and change things around so it was more comfortable for us, but after a few weeks the structure always reverted back to the more acceptable “Korean-style”. And this style almost always lent itself to a pre-set formula: Christian evangelizes to the unsaved, unsaved watches a set of DVDs containing a Bible seminar briskly summarizing Biblical teachings, the unsaved comes in for “counseling” with a pastor, the unsaved has a light bulb moment that makes them realize that the Bible is truth, the unsaved makes a profession of faith, and finally – and only after approval by the pastor – is welcomed as a member of the church. What I found strange was that this was considered a very linear process. According to Lee Strobel, Rick Warren, and other influential Western Christians, Christianity was seen as being more multifaceted. People could have doubts, people could lose their salvation and regain it, people could pray and worship in different ways depending on their individual preferences and talents. In my church it was unheard of for someone to have doubts or struggle once they had become “born-again”; this meant that they were really just never saved in the first place, no matter how much they thought that they were. And that’s exactly the issue: sometimes they had no say in the matter, and it was the pastor (not God?) who had the authority to decide whether or not that individual was truly “born-again” and had the privilege of remaining a member of the church community. And perhaps it was a privilege. 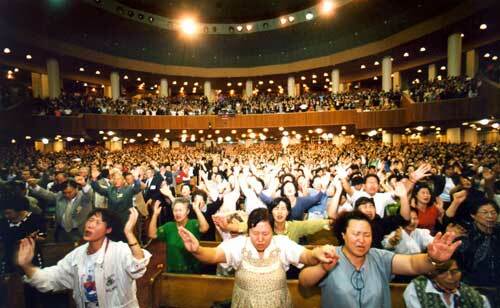 My church was so expansive and distinguished that I once met a Korean pop star there. Either way, the pressure of subscribing to a rather narrow set of practices is probably enough to turn off many Western Christians form the Korean church community. But this is not to say that attending or even joining a Korean church is unwise, if only just to get the experience. I did encounter some of the most genuine and warm-hearted friends I have ever made there, and if unpleasantries in the system itself aren’t enough to deter you, joining an English or foreign fellowship is a good way to build a support system while living abroad. In my opinion, however, try to seek out a church that doesn’t advertise publicly or hound you on a busy street (I met the first proponent of my church casually through a language-exchange website) or a smaller church, as these are less likely to emit capitalistic vibes or make you feel like part of The Borg. What might be the hardest to swallow for those involved in Buddhism or Catholicism, however, is not the Christian doctrine itself, but rather the ultramodern path to success that Korean Christianity has eked out. Void of exquisite Gothic architecture or richly multi-hued robes or calming incense, the modern Korean church broadcasts sermons given from behind plastic pedestals onto enormous flat screens and well-maintained websites. Most church paraphernalia is factory-made (there are several stores near Seoul’s Central Terminal that universally outfit most of the city’s churches) and the buildings themselves are often indiscernible from nearby office complexes. Of course, true faith need not be intertwined with remarkable material display, but much of South Korea’s older generation – and even some of the younger crowd who do not associate themselves with any religion at all – feel they must now fight to keep colorful Korean traditions such as samulnori, farmer’s dances, and elements of shamanism on the forefront of what is introduced to tourists, rather than a mass-marketed faith culture that they feel neither represents Korean history nor imbues tourists with a sense of the country’s uniqueness. Will the rise of Christianity continue to threaten Korean tradition, or is it just another passing fad? Few other religious movements have had the leveling power of Christendom, especially when powered by such colossal evangelical congregations. As South Korea continues to perceive and welcome the connection between economic growth and the presence of God, traditionalists could have a difficult time evading the jaws of the salivating beast of salvation. For more on traveling in South Korea, visit Vagabondjourney.com’s South Korea travel guides. “Played the poor card”? You mean you lied to avoid paying TEN DOLLAR monthly dues?! Nowhere in this article does it indicate that the author lied about anything. In fact, it says that she was honestly exempted from this fee. I would think she made a mistake there and meant to say 10% of her income, which she explains in the paragraph before saying $10. I’m just curious, Tiffany, what was your role in the church when you were there? Just a casual observer, ie went to observe only, or are you Christian? From what she’s told me, she’s a regular church goer.